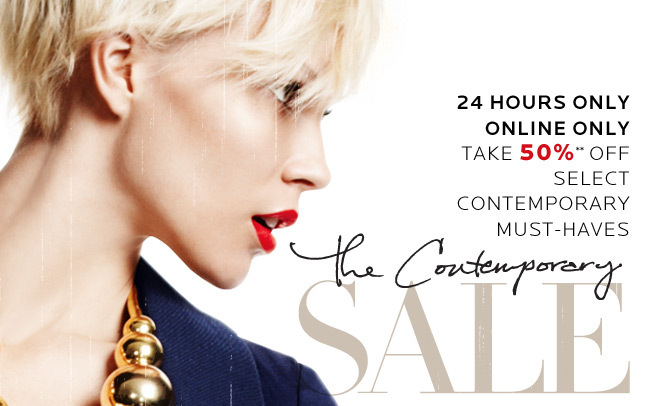 For two glorious days, take 15% off the sale merchandise at ShopBop with code "EXTRA15". 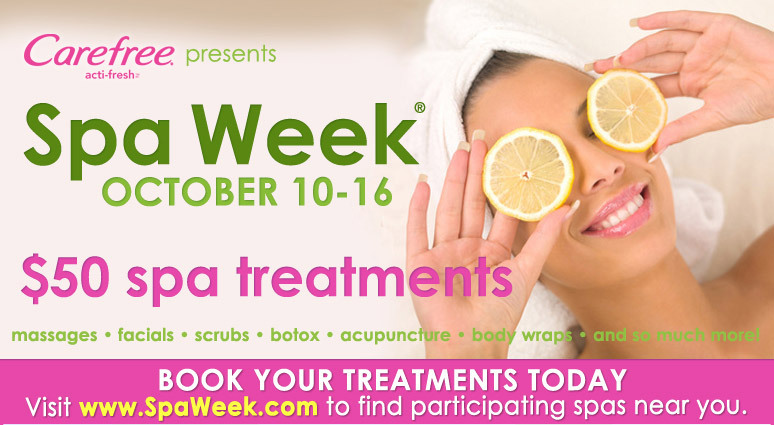 Ends Wednesday, Oct 26. Super on the D/L this year, Sephora is making you request your own F&F code. 20% off everything, online only, and ends Nov 2. Get your code here. And spread the word to all other beauty lovers! Psst. ShopBop is hosting their F&F event right now. 20% off everything* until 11:59PM Oct 19. Use code "INTHEFAMILY20". Not too many exclusions, so if you're eyeing something in the Designer Boutique, you should prob go for it. 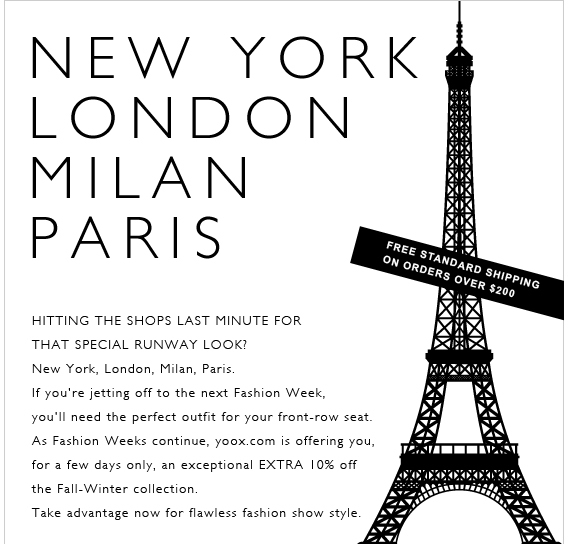 Saks F&F is going on right now too (20% off, no beauty, and TONS of exclusions). Barney's Purple Card (giftcard) event is right around the corner too. Shop strategically! 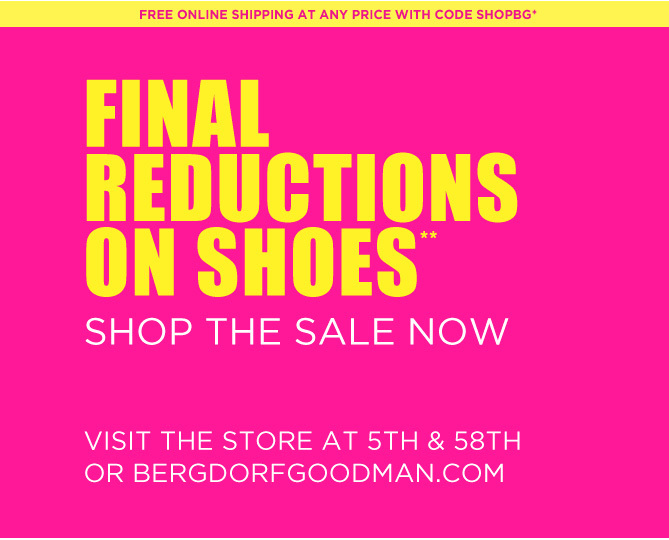 Exclusions: 3.1 Phillip Lim, Alexander Wang, Maison Martin Margiela, MM6, UGG Australia, Proenza Schouler, Thakoon, Reem Acra. 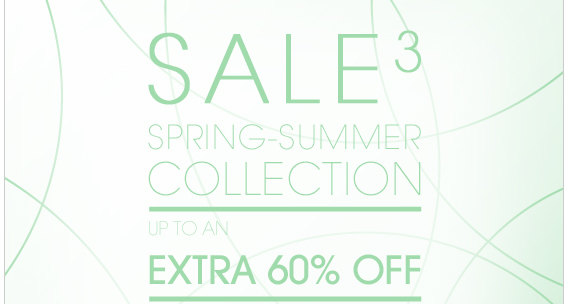 The sale at YOOX.com has reached 85% off. All sales are FINAL. Free shipping for $200+. 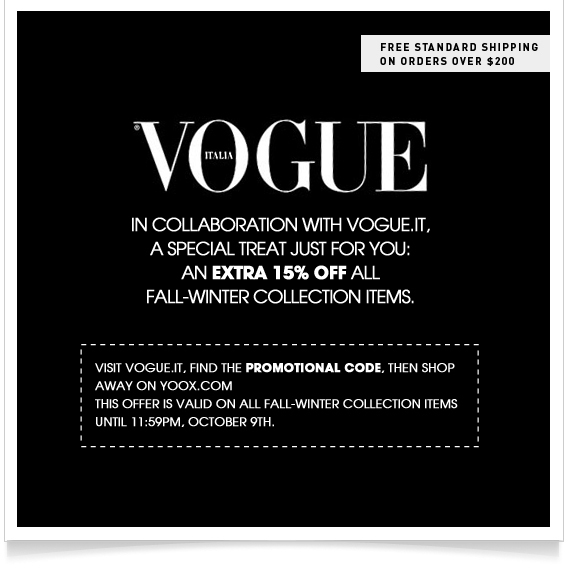 In collaboration with Vogue Italia, use code "WEEKENDVOGUE@YOOX" to get 15% off all the fall-winter merchandise until midnight Oct 9. And free shipping for $200+. I don't know why everyone hates Columbus all of a sudden, but it appears F&F is the way to go this year. Take 25% off everything except the shoes you want at ToryBurch.com. Use code "FRIENDS2011". Starting at noon EST, use code "SHARELOVE20" to get 20% off at TheOutnet.com during their F&F event. "Just In" items are excluded, but everything else is fair game! Ends at midnight on Monday, Oct 10. In celebration of Columbus Day, NM's LastCall.com is doing a compounded discount. On top of their current 30% off promo, they are offering another 15% on top. Pretty enticing w/ their $50+ free shipping combo. *sigh* Life is too hard. Decisions decisions! Shop now through Sunday, Oct 9 and get $25 off $100+ or $50 off $200+ at CoutureCandy.com. Use code "FRIENDS". Update: the free shipping is international too! 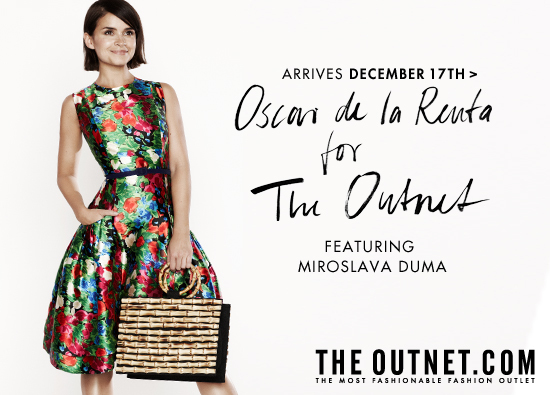 Starting tomorrow at noon (that's Sep 30 at 12:00PM EDT), TheOutnet.com is shipping for free. That's like an instant $5 savings (hey, every little bit helps, right?). It will end Monday at noon Use code "FREESHIPSEPT". Speaking of the devil... the YOOX sale has gone down to 85% off, which is the last cut before it's final sale. So if you're on the fence, now's the time to make a move. Through the end of Sep, use code "FASHIONPEOPLE@YOOX" to take 10% off the fall-winter stuff. 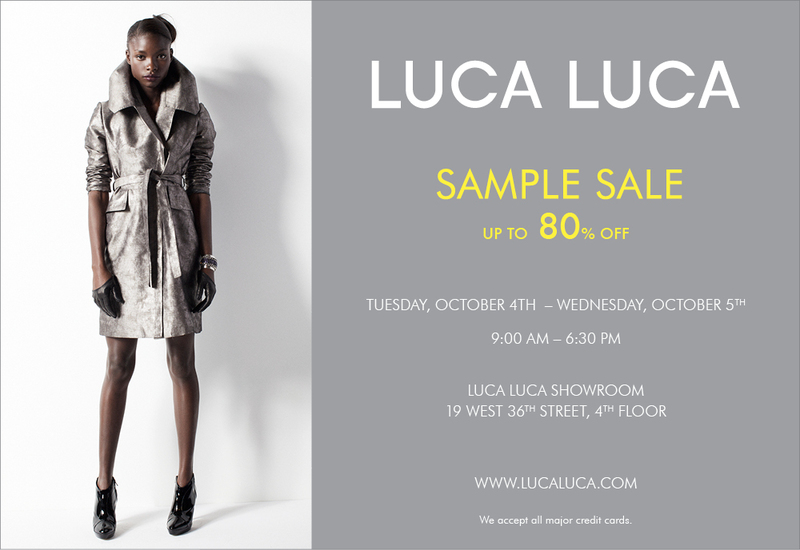 I also feel like their online clearance section is winding down, so hopefully their "sample sale" will happen in Oct! If this isn't a call to arms, I don't know what is... Free shipping too! 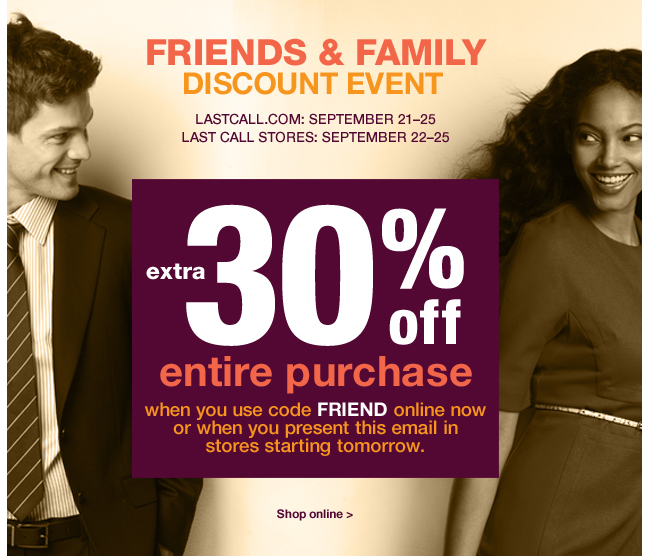 Take 30% off your entire order at LastCall.com with code "FRIEND". Online F&F event ends Sunday, Sep 25, and in-store F&F event starts tomorrow and ends Sunday (but print out the email and bring it with you). P.P.S. I have a leftover Gilt City certificate for a Brazilian at Completely Bare. Anyone wants it can PayPal me $25 and it's yours. Expires Oct 22, 2011. Going on now, Satya Jewelry and Costa Rica Roots Collection are having a sample sale at Chelsea Market. It's in Prive's typical space. I love Satya's culturally-themed jewelry, and historically their sample sale prices have been quite good. I don't know the Spend $X Save $Y amounts (max is Spend $1000, Save $200), but make sure you bear in mind BG's beauty event starting Thursday. Almost all brands have a gift-with-purchase. So here I am in France with maybe 20% of my clothes and 10% of my shoes. I have to say it's been a lot of fun (so far) living here, and there are lots of things I have totally embraced-- the 3x a week farmer's market with the absolute best fruit, drinking all the time, and living a little more simply. But maybe they do it too simply... did you know the French take siestas!?! No joke, most stores are closed from noon-2PM (something a New Yorker found outrageously frustrating). Given that they open at 9AM, or even 10, and close at 5:30, it gives new meaning to the term "banker's hours". One one hand, I am getting a seriously good education (or so I hope) and meeting lots of great people. On the other hand, I miss having time to do online shopping, blogging (! ), and participate in things like Fashion's Night Out. I'm missing the my favorite sample sale and the Mercedes Benz Fashion Week and Derek Lam is there. Just typing that makes me want to bang my head against a wall. I'm trying to figure out this whole shopping-in-France thing. For one, everything is just more expensive. Really, given how affordable everything is in the US, I'd hate Americans too. Monoprix, which I liken to Target-level clothes, sells tops at 40-90€ ($56-126 USD), which I am just not used to. I can make $125 go a long way in New York! I guess I'm totally spoiled, because walking around, I think to myself, I can get Burberry pants for 200€ back home rather than some random boutique brand. So needless to say, I am not doing much shopping here. 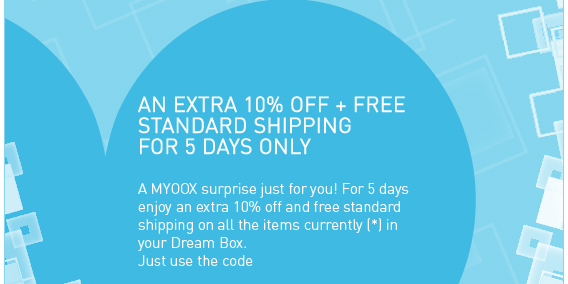 YOOX.com for the US is infinitesimally better for Americans too, which makes me scratch my head. After all, most of those goods are European labels, so how is it cheaper for goods made here to sell there? So what I've learned: if you live in the US, don't feel guilty about buying. Lots. :) I am definitely shopping online and sending things to New York, for my hubby to bring in October. Not sure when I will post again. I'm trying to see if there's anything to be learned about sample sales in Paris. I hear they do exist-- fingers crossed! ASOS.com is doing their final call. Use code "EXTRATEN" to get +10% off. 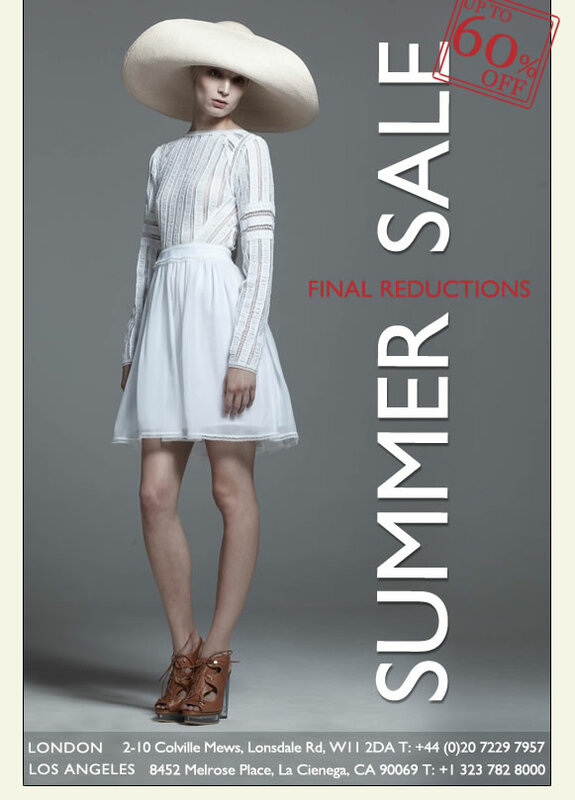 Temporary markdowns on items by Alice + Olivia, Bird by Juicy Couture, Catherine Malandrino, Ella Moss, Halston Heritage, Haute Hippie, Helmut Lang, MARC by Marc Jacobs, Milly, Nanette Lepore, Robert Rodriguez, Theory, Tory Burch, and Vince. Use code "NMAUG" for free shipping too. 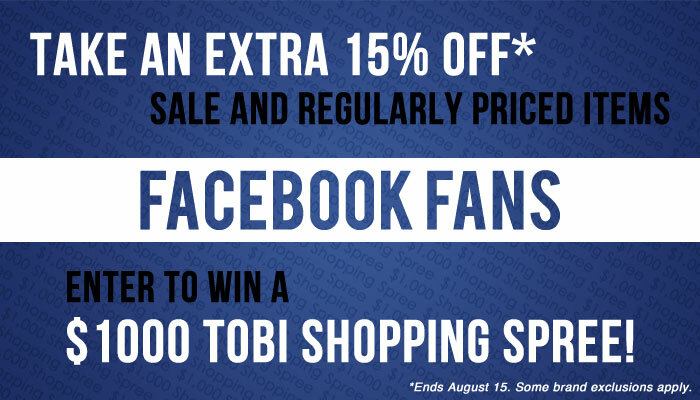 Ends tomorrow, Aug 18 at 10:59 AM CST. As I did some online browsing (and shopping) to bulk up my cool-weather wear for France, I came across a nice stash of Rachel Roy Signature pieces on YOOX.com for $45+. Needless to say I got really excited and ordered a work blouse and this really cute short-sleeved cardigan. They came today, and I'm keeping them! The short-sleeved cardigan is absolutely adorable (and only $59!). Rachel Roy sizes run on the larger side, so make sure you check her fit guide. For today, use "FACEBOOKGIFT" for free shipping. For tomorrow, you'll have to check their Facebook page for the new free shipping code. 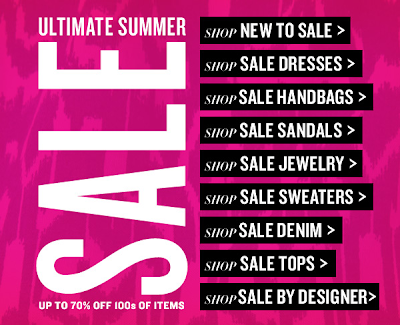 This weekend TheOutnet.com is doing an extra 20% off tops. Although I am no fan of ScarJo, who am I to argue with $44 dresses? 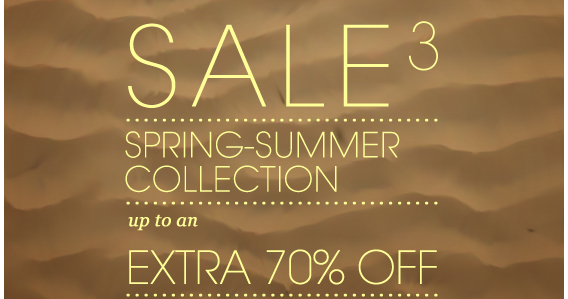 MANGO's summer sale hits 70% off! 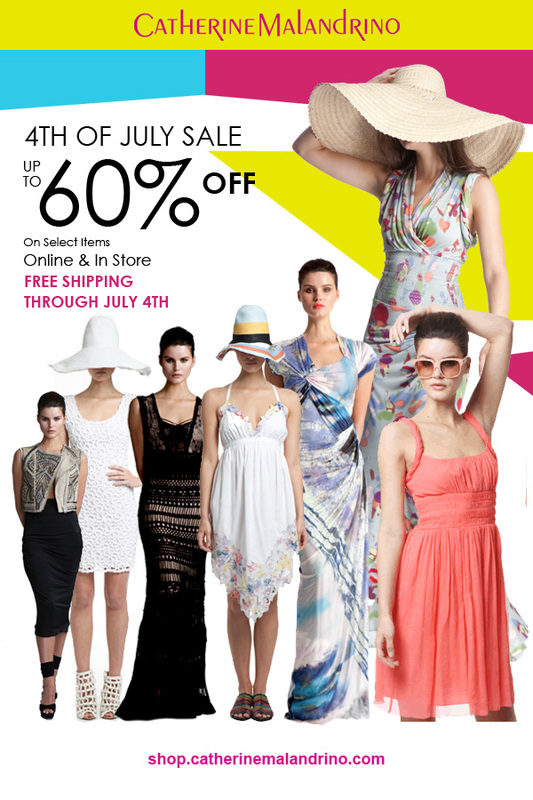 Catherine Malandrino is doing a 4th of July sale online and in-stores. Up to 60% off select items, but free shipping on all. 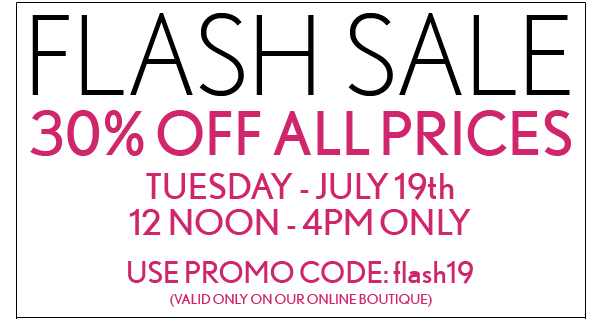 Ends Monday, Jul 4th. Something worth paying attention to: Vivienne Tam is doing 50% off everything online from Friday, Jul 1 - Monday, Jul 4. 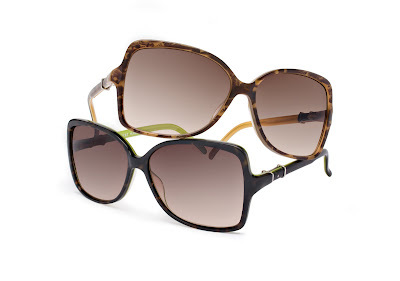 Today the more you buy the more you save in NeimanMarcus.com's sale section. Not only have they marked down prices, you can take +30% off when you buy 2 items, or +35% off when you buy 3+ items. Ends today. Hop to it! Starting today and ending tomorrow,the Cushnie Et Ochs sample sale is going on in the Garment District. 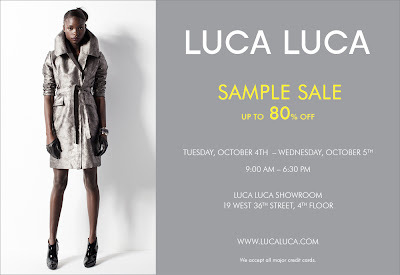 They'll have RTW and runway shoes (I'm guessing worn by the models) for 60-90% off. Last round of discounting. +20% off. 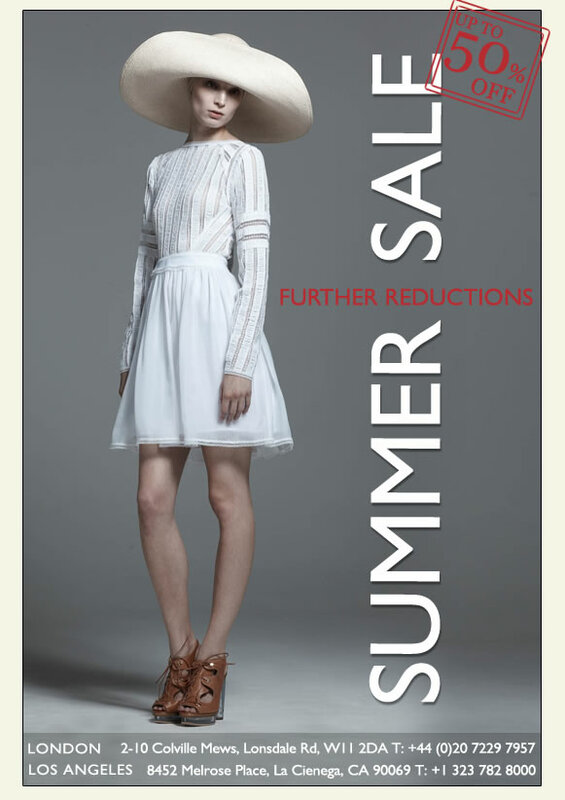 Temperley has slashed prices to 50% off in-stores and online.